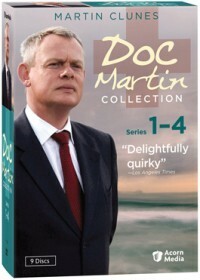 Doc Martin Collection - Series 1-4 DVD Review And Giveaway - Are You Screening? For all the British television that makes some effort to cross the pond, some shows simply can’t be reworked for American audiences. Luckily, most of them make it to us anyway, and the latest, brilliant effort to come by way of PBS (and of course, DVD) is Doc Martin. Starring the by now legendary Martin Clunes, who has been a part of so many amazing British series that it boggles the mind, Doc Martin is the story of a star surgeon who suddenly develops a blood phobia. With little choice in his career path, he takes the job of GP for the small village of Portwenn, where he spent much time as a young lad with his aunt (Stephanie Cole). Hoping that the rural doctor life will consist largely of colds and the odd bruise, Martin hopes that with blood at a minimum he can overcome his problem and return to surgery. Unfortunately for our misanthropic hero, general practice may have less blood, but it also involves a simply unconscionably greater amount of talking to people. In Portwenn, that can mean a lot of being forced to deal with some odd characters, something Martin has little patience for. Complicating matters further, Martin finds himself rather interested in the lovely Louisa (a perfectly cast Caroline Catz), a teacher at Portwenn’s school. Each day is a new trial for the good doctor, and while that just about goes without saying when it comes to the maladies (both real and imagined) of a tight-knit village, things go a step further when the real problem isn’t what specific ailment one might have, but the mere fact that you showed up at all. Discourteous, easily irritated, and always carrying the inner grudge that he has to be here in the first place, Martin’s life is a constant struggle, and one where he never seems to gain any ground. Forced to deal with a busybody chemist (who is a bit touched in the head, really), and the ever-present get-rich-slow schemer Bert Large (Ian McNeice), along with the other nameless rabble, would be bad enough, but he has to somehow put forward enough of a human persona that he doesn’t completely alienate Louisa. It’s clear dramedy, and the kind of show that could only come from British sensibilities and humor. It’s one of the most hilarious shows that has ever been on television, but I don’t think it’s likely that you’ll ever laugh out loud. The four series in this DVD set (a fifth has been ordered and films this year) run through a wide range of events, both in terms of episodic stories, and the overall arc, and even in this respect the show sets itself apart from the usual American fare. Characters come and go, then come back, and our love interest angle plays out in a form true to the characters we’ve established. There is, at the back of everything, a certain level of respect for Doc Martin that you rarely see, and that comes through in the way that, while we may put him in situations that will hopefully move us along toward good television, we let him do with them what they will. For anyone who is a fan of any British television, this is a must own. The only unfortunate aspect of this release is that it is rather lacking in terms of bonuses. It has some cast trivia and photo galleries, but that’s about it. Still, this is not only a wonderful, quirky show, but it is a true ensemble effort with a perfect supporting cast. From series two on, Katherine Parkinson (The IT Crowd) takes over as Doc Martin’s receptionist, and she’s brilliant. The huge hit dramedy currently airing on PBS stations across the U.S., Doc Martin Collection: Series 1-4 has arrived on DVD. Akin to House and Northern Exposure, BAFTA Winner Martin Clunes (Men Behaving Badly, Shakespeare in Love, Dirty Tricks, Reggie Perrin) stars in the series as a misanthropic, socially maladjusted doctor forced to relocate to a rustic seaside village, where he immediately clashes with the town’s eccentric citizens. Doc Martin is a huge hit in the U.K. with 9 million viewers and a fifth series commissioned, and is syndicated by American Public Television (APT) in the U.S. This value-priced 9-disc collection includes all 30 endearing and off-beat episodes from the first four series, in addition to photo gallery, cast trivia, cast filmographies, and more. The doctor is in—but he’s not happy about it. After developing a crippling fear of blood, hotshot London surgeon Martin Ellingham (Martin Clunes) is forced to retrain as a GP and relocate to the charming seaside village of Portwenn. Dour, discourteous, and dismissive, he immediately clashes with Portwenn’s quirky villagers. In these four complete series, Doc Martin catches the eye of the most beautiful woman in Portwenn (Caroline Catz, Murder in Suburbia, The Guilty) tests the patience of his long-suffering aunt (Stephanie Cole, Waiting for God, Tenko), and repeatedly hurts feelings as he heals bodies. Martin Clunes delivers an uproarious lead performance, aided by an outstanding supporting cast, in this award-winning comedy. Doc Martin debuted on ITV in the U.K. in September 2004. Since then, four series have aired. A fifth series has been commissioned by ITV and will be filmed in 2011. Filmed in the idyllic Cornwall village of Port Isaac, Doc Martin won the 2004 Best TV Comedy Drama at the British Comedy Awards.